I feel like there’s a maelstrom swirling around inside me lately. Along with relaxing to some of my favorite shows, I’ve been throwing myself into writing. Writing anything – my book, blog updates, tweets, even my first fanfic – just to keep that swirl of stressful worries from tearing me open. With that in mind, here’s the next bit of the Magical Roots Challenge. I’m a polytheist, usually leaning towards the hard side, but somewhat soft in regards to PanCeltic deities I suppose (for example, I see Brighid being the same as Brigantia). I primarily work with Brighid, and I consider myself her priestess. I’m always working to improve in this aspect. I’ve been trying to revitalize my flamekeeping practices to make them more reflective and spiritually oriented, but it’s difficult as a mother. I mean… you can’t meditate all day when the child wants to watch cartoons or would prefer to race you up and down the sidewalk instead of taking a walk along the hedge. But I try, and consider motherhood one of the challenges she has given me through which to learn and grow as an individual. I also work with her as my primary muse, the protector of our hearth and home, and unofficial grove patron*. I even work with her as my gatekeeper in most rituals simply because of the closeness I feel to her, and her connection to all three hallows. It just makes sense to me. It’s worked really well in my personal and grove rites. Rather than a poem, I’m including a photo of a simple doll I made to represent her. 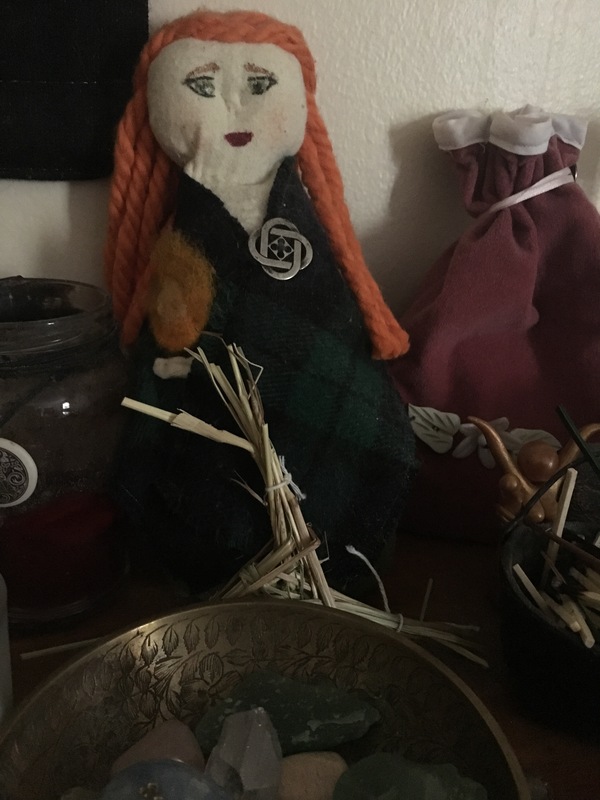 She sits on my altar, always a reminder and focal point during my flametending work. I should write a poem to her though… The thoughts are there, especially with what I’m going through and all the chaos in the world… I just need to organize them. I’ve also been thinking about a short story… Soon, my friends. Soon. I don’t often work with crystals. In fact, I usually don’t buy them anymore. I’ve written in the past on the reasons and why I prefer to work with stones I find in the forest, in lakes, or rivers. I do some work with my quartz crystal ball, though. I brought him home years ago from one of my favorite and most trusted mineral stores – Sticks n Stones. I put him in the window during the full moon to charge, and he usually hangs out on my altar to energize things as I need. Fun fact – he has a bit of a crack. I got him on a discount, but I love him all the same. As a young Pagan just finding my way, I thought having a crystal ball would be très chic, and I was curious about scrying. I wouldn’t have been able to afford one of the flawless balls, so I adopted what most people would have overlooked as a flawed piece. Regardless, he still came from the Earth mother and is one of my treasures. Incense is one of my favorite offerings to give. As a Sagittarius, I’m drawn to flames. I love the way my prayers spiral upward and outward to the spirits on perfumed smoke. Brighid often requests it. UPG- she loves spicy scents like cinnamon. This prompted me to try making cones with ground cinnamon. So easy! I aspire to make more incense by hand. I attempted some simple kyphi, but it didn’t turn out well. My goal is to get makko powder and experiment with that, and I would really like to work with resin from local trees. I fancy myself a bit of a kitchen witch. Much of what I do revolves around the hearth, and it’s a natural extension of my work with Brighid. (I mean, really… weren’t most of our ancestral mothers doing folk magic in the kitchen at some point?) Along with candle magic, doing work with food or tea is one of my favorites. It’s easy and practical. Feeling ill? Make a tea to help you physically and spiritually. Stir some energy and say a prayer over that ginger, lemon, and honey. Cut some sigils into your dough. Stir the pot of soup a certain number of times as you add seasonings and pray for blessings and nourishment. Make special dishes to reflect the seasons, and be sure to give some as an offering! Most importantly, say prayers of gratitude before eating and, if possible, start to compost and garden so you can bring the magic of the plant world and its cycles into your kitchen. Connect to the land during the high days – literally and not just metaphorically. Where there’s a will, there’s a way. 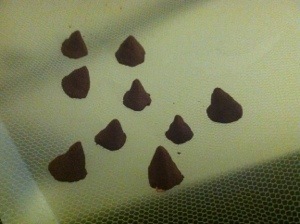 I’ve been working on my own, homemade incense cones this month. I’ve been charging ingredients with lunar and personal energy. I’ve utilized some of what I’ve learned in trance work too. This is my attempt at a cinnamon incense. I strongly associate the scent with Brighid and thus anything involving hearth magic, arts, and crafts. They will be burnt as offerings during such workings. An offering of spicy tea for Brighid in lieu of incense. Photo by Grey Catsidhe 2012. Alcohol, caffeine, sushi, unpasteurized cheese… Just a few things pregnant women are told to avoid or limit. Changing your lifestyle is part of expecting. I already find it’s impacting my spiritual practices, but not in a way that is terribly annoying or negative. One such change has been incense. Upon learning of my pregnancy, I started to look into it out of curiosity. There’s smoke involved, and everyone knows pregnant women shouldn’t be smoking. There are some studies floating around about the negative correlations between incense smoke and health problems, including cancer. People who burn it every day in an unventilated space should be especially concerned. Incense, like some other burning matter, releases polycyclic aromatic hydrocarbons, a pollutant. Some studies link exposure to these during pregnancy to possible behavioral problems. I used to burn incense a few times each week as offerings, so that probably puts me somewhere between a casual and heavy incense user. I’ve sometimes thought about the smoke, especially as the weather cools and our windows close. Although there is arguably room for more studies on the impact of incense on health and, in particular, pregnancy, I don’t feel like taking any chances. The only time I currently feel comfortable with it is during outside ritual. Earlier this year, I explored tea as an alternative to incense. Just as with the fragrant sticks and cones, herbs are combined with heat. The scent wafts upward with the steam. Utilizing fire and water seems particularly magical, although it’s admittedly not as potent as incense. Don’t expect it to mask pet odors. If your desire is to create a fragrant smelling atmosphere, a trick my mum taught me may please you – especially during the colder months. Before visitors come, my mum likes to bake an apple (cut in half) covered with some cinnamon. She bakes it in the oven for 15-20 minutes on a low setting – until the apple becomes soft. The scent is strong and far more pleasant than any artificially scented candle! In the spring and summer, why not opt for locally grown flowers placed on a central altar? Oil diffusers could be another possibility, but pregnant women must be so careful about which oils they handle. Several sites I’ve looked at all suggest that lavender is safe. Given it’s calming properties, it seems like a good choice for those expecting. I’m especially drawn to simple terra cotta ornaments that don’t require any flame. (Check out this adorable diffuser pendant from napotterystudio on Etsy! Perfect for a Brighid shrine!) Should you decide to try a candle diffuser, definitely choose to use organic soy or beeswax candles as paraffin wax has shown to be more dangerous. I definitely intend to keep digging into this matter as it’s one that is close to many Pagans. We (generally) love to make offerings, use candles, and burn incense. Yet, as a mother-to-be, I want to err on the side of caution. Wouldn’t you? Please share your ideas or any information you find!